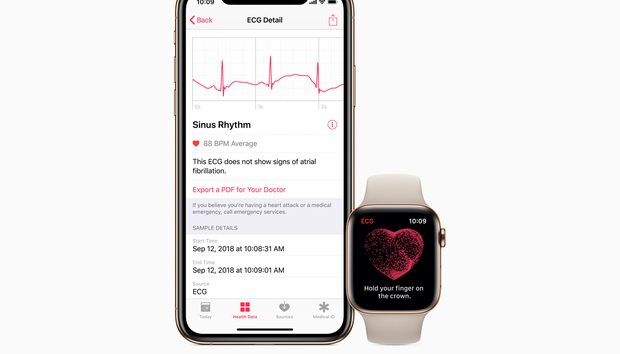 Part of the watchOS 5.1.2 update, the new ECG app and the new irregular heart rhythm notification feature can be used with the Apple Watch Series 4 to monitor heart rhythms. An ECG can be performed at any time, and ECG recordings, classifications and any noted symptoms are stored in the iPhone’s Health app. A PDF of the information can be provided to physicians. Macworld will have a detailed hands-on with the ECG app soon after the update becomes available. Important: The iPhone that connects to the Apple Watch Series 4 needs to be updated to iOS 12.1.1, which was released on Wednesday. To update the Apple Watch Series 4, the update is downloaded to the iPhone, and then the iPhone connects to the Apple Watch to perform the installation, which can take several minutes. Before installing the update, the iPhone has to have a Wi-Fi connection. The Apple Watch has to be charged to 50 percent, and the watch need to be connected to its charger. The iPhone and Apple Watch need to be near each other. Here’s how to get the watchOS 5.1.2 update and install it. Tap Download and Install to download the update. This will take several minutes. Then the installation will run automatically. You may need to enter your passcode on the Apple Watch or iPhone. « What's in the latest Chrome update?